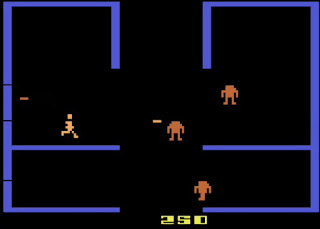 Berzerk is and maze shooter game that was originally released by Stern Electronics as an arcade game in 1980 and was later ported to the Atari 2600 in 1982. 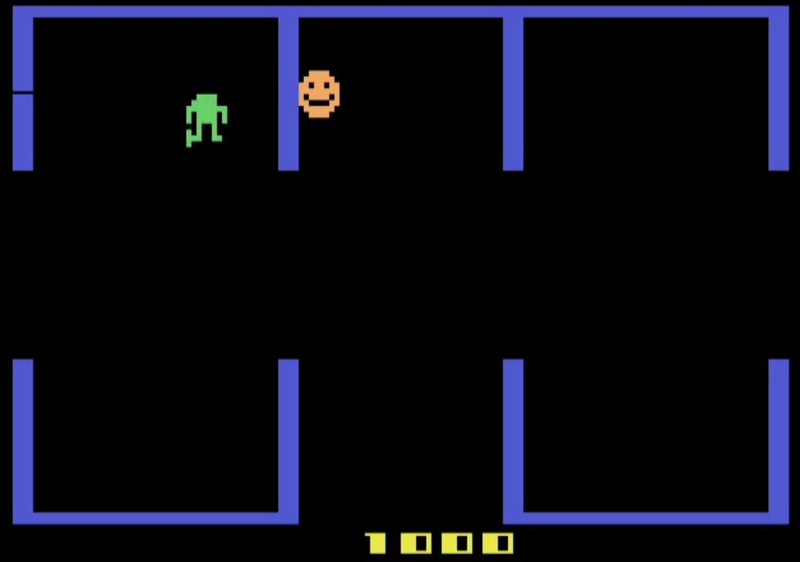 A classic arcade game, will this Atari 2600 port be as bad as the Pac-Man port?? As far as my video gaming went I first played on a Commodore 64 and then the Nintendo NES. I never had or even played on an Atari 2600 as a kid so even though there are suppose to be some great games on it. 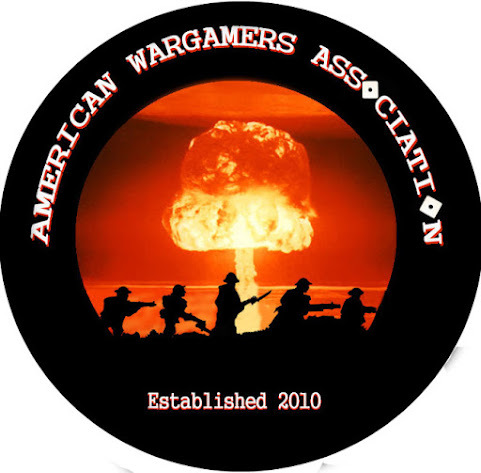 I do remember one day a kid down the street was having a yard sale and was selling his Atari 2600 and a bunch of games. 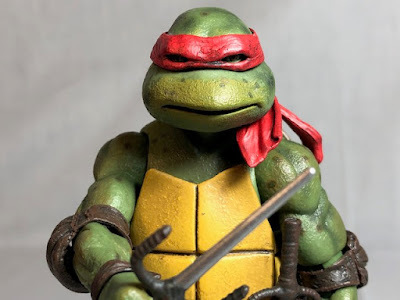 We asked our mom if we could get it and she said no but we were able to get money to by Top Secret Episode for the NES. I figured that the people who praise Atari 2600 games do so because they were great when they were new. 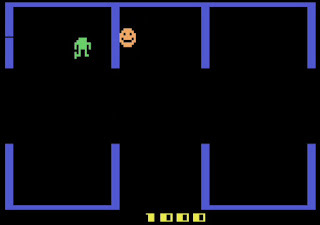 This is the first Atari game I ever played and it's surprisingly a good game. You play as a man, I don't have a manual so I'm winging the "plot". Your job is to earn points by killing robots. You have a laser gun you can shoot eight directions. The robots will also try to kill you with their laser guns. If they fire at you and you fire at them the beams will cancel each other. If you get a robot in between yourself and a robot shooting at you the robot can kill the robot in the way which makes your life easier. The robots will also shoot at you even if you're behind a wall but their shots won't hit you. 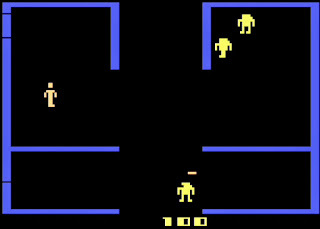 One of the reasons that I liked this game immediately is because it the room setup looks just like Castle Wolfenstein (I know Berzerk came first) which is one of my all-time favorite games. Each time you go through a door you'll enter a different type of room layout, I'm guessing that there is some pattern but I didn't notice it. When you're maneuvering around in a room you have to be careful near the walls because they are charged with electricity and will kill you if you touch them. As the game goes on and your score goes up the robots become less stupid and actually get dangerous. They move fast and shoot faster and don't kill themselves in the walls as much. To the best of my knowledge, there isn't really an end game except for a high score which is how many of the Atari 2600 games operate. Because of this, you'll eventually lose interest killing bad guys. The game has a fix for this, Evil Otto. Evil Otto is a smiley face bad guy that will eventually start to chasing you. He can go through walls to get you so you need to move when you see him. If he gets you you're dead. I find it funny that a guy with the name Evil Otto is a Wal-Mart looking smiley face. 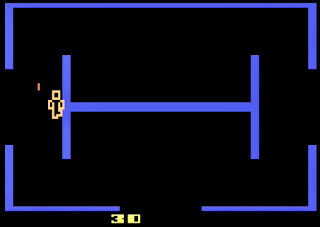 Berzerk is a fun game that is still playable almost 40 years since it made its debut. If a game can be enjoyed by someone who was born after the game came out it then it's a great game. How many games can you think of made in the last ten years that aren't good? 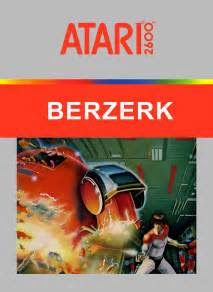 Bezerk may not be for everyone but I liked the game so if you have a chance give it a try. 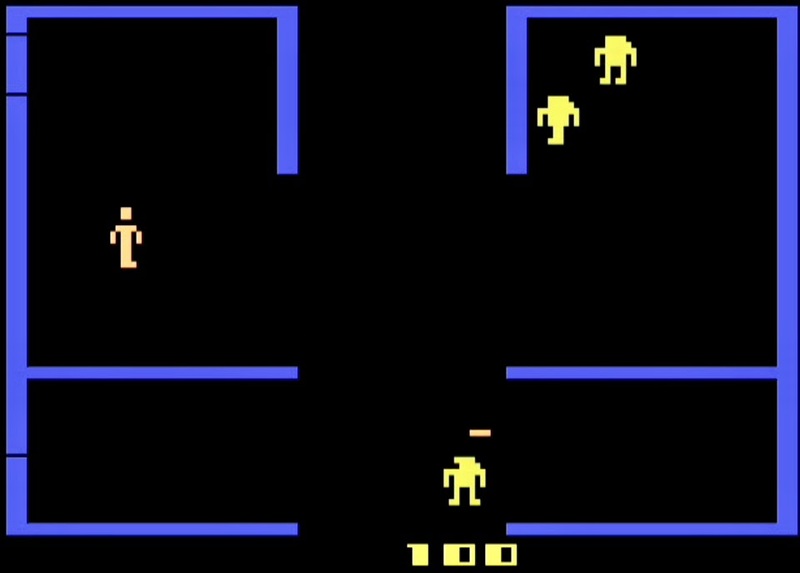 I give Berzerk a 7 out of 10.